Director Abhinay Deo debuted in Bollywood in 2011 with the out-of-the-box black comedy Delhi Belly. The film was widely lauded for the content as well as performances and it even won major awards that year, including Filmfare's Best Debut Director. Following that, he made the TV series 24 (Indian version) and John Abraham starrer Force 2. 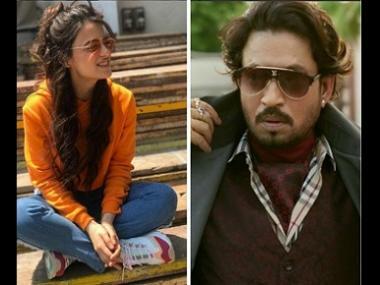 The director has announced his next film titled Blackmail which stars National Award winning actor Irrfan along with Pink and Indu Sarkar fame actress Kirti Kulhari along with Divya Dutta and Arunoday Singh. After #DelhiBelly, #AbhinayDeo’s quirky comedy titled #Blackमेल now to release on 6th April 2018 starring @irrfank, @IamKirtiKulhari, #ArunodaySingh, @divyadutta25 and @OmiOneKenobe. Produced by TSeries and RDP Motion Pictures. The film is reportedly a "quirky comedy" much like Deo's Delhi Belly. According to a report by Bollywood Hungama, this film revolves around Irrfan, a middle-aged married guy who leads a mundane life. His life goes on a roller coaster ride when he realises that his wife is involved in an extramarital affair. T-Series is co-producing the film along with RDP Motion Pictures. The film will release on 6 April.